The carved work of the stalls in Lincoln Minster is disfigured by a dirty stone-coloured wash; and the pillars are stained with a variety of colouring, which, nearly viewed, has a disagreeable effect. The stained windows of Lincoln Minster are done by Peckett in his usual brilliant style, but without figures, in which perhaps he did not excel. 1088. Cathedral built (chiefly perhaps of wood) by Remigius, the first bishop, and finished in four years. 1124. Rebuilt by Alexander, a Norman, and arched with stone, having suffered by fire. 1147. Episcopal Palace, now in ruins, built by Robert de Chesney. 1186 to 1200. East end by Hugh de Grenoble, afterwards called St. Hugh. 1436. Porch to the great south door from the bishop's palace (which door is now walled up), by William Alnwick. 1480. Chapel east of the great south door by John Russell. 1541. Chapel, west of ditto, by John Longland. The above were all Bishops of Lincoln. There is no account of the date of the towers; but the upper part of the West towers appears to be subsequent in date to the east end of the building; and the great tower to be still more modern. Interior view of the choir, with the Lady Chapel looking to the east. In this view the following alterations have taken place: the lower part of the stall-work has been removed, and modern pews substituted; the upper part will probably soon share the same fate. The organ seen on the north side is now placed over the entrance into the choir. The Grecian altarpiece has likewise very properly been destroyed for one somewhat more in consonance with the rest of the building, in which is a modern painting of the Annunciation by the Rev. Mr. Peters. And the east window, which here appears to be of plain glass, is now filled with colours vying with the rainbow. Ichnography of the cathedral. The brasses and numerous monuments here referred to have for the most part either been destroyed or removed from their situations over the graves of the persons they commemorate - a practice which no custom can justify or opinion authorize. The cloisters appear to be made use of only as a receptacle for the remains of these monuments, which are scattered about in all directions. Had the immense sums expended in unnecessary repairs been applied to the proper restoration of the chapels and monuments in different parts of the building, how laudable would have been the example! As it is, those who venerate this cathedral can only lament what they cannot remedy. If, however, an Act of Parliament can be procured for a branch of medical reform, which tends to knock free agency on the head, by withholding medical assistance by which life may be preserved and death prevented unless legally sanctioned by an university, surely it would be no difficult matter to obtain a Bill to restrain those to whom the repairs of cathedrals are delegated from using that power, unless approved of by more competent judges in architecture than themselves. J. "In the beginning of 1753 the wicked chanter, Dr. Trimnell, of his own authority, pulled down the eleven fine images of kings over the west door of Lincoln Cathedral, to put up a foolish inscription of the names of the subscribers to the new iron rails." The same was said of a late Dean of Lichfield, that, being whimsical or deranged, he fancied the kings, who in two rows graced the west front of that cathedral, would some time or other tumble on his head as he went in and out, and employed a chimney-sweeper's boy at great hazard to pull them down. Q. Q. 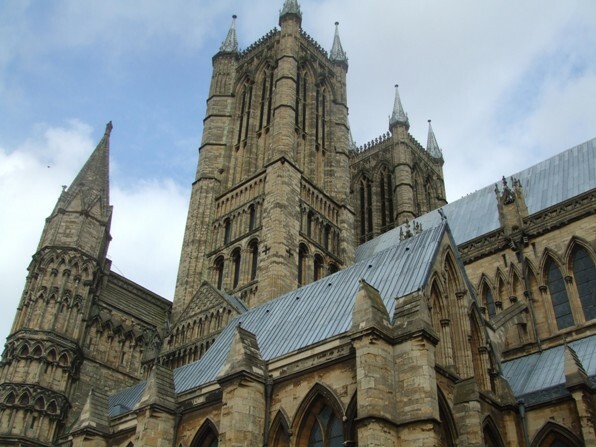 The Episcopal Palace at Lincoln is situated on the south side of the hill, near the summit, and possesses a commanding view over the whole of the lower part of the city, as well as of the villages on the opposite hills. 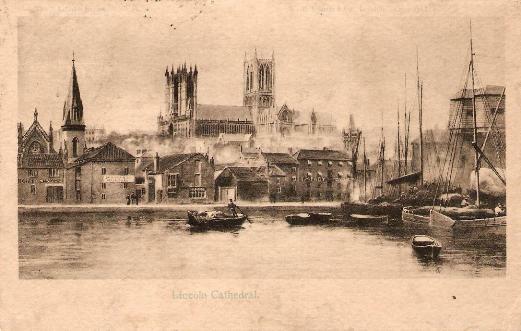 This once magnificent structure was begun by Bishop Chesney, to whom the site was granted by King Henry II., being the whole of the land, including the foss, from the wall of the Bail of Lincoln, by St. Nicholas Church, to that of St. Andrew, and from thence east to the city wall, free and quit of landgavel, portage, and all other things, with free licence to break a gate through the bail wall for his passage to and from the church. Hugh, commonly called St. Hugh de Grenoble, who was consecrated September 2, 1186, enlarged this mansion with several apartments, some of which were of great magnificence. He began the grand hall, which measures 85 feet in length from north to south, and 58 broad from east to west. The roof was evidently supported by two rows of pillars of Purbeck marble; part of the pilasters, supported by corbel tables, are yet remaining at each end; these being of octagonal shape, convey the opinion that the other pillars, as well as the materials, were of the same sort. The middle aisle, measuring from centre to centre of each pilaster, is 35 feet, and each side one twelve feet and a half. Four double windows on each side lighted this sumptuous room, and an elegant screen at the south end, of three pointed arches, now walled up with bricks, opened a communication with the principal apartments and kitchen, by means of a bridge of one pointed arch. The grand entrance was at the southwest corner, through a beautiful regular pointed doorway, supported by clustered columns, with detached shafts and foliated capitals; two other recesses, with very high pointed arches, one on each side, give peculiar spirit and elegance to the design. Attached to this entrance was once a porch or vestibule, the present remains of which bespeak it to have been a structure of superior taste and elegance. This princely hall was finished by Hugh II., his successor, and doubtless furnished with all the pomp and magnificence peculiar to the age. . . . Bishop Hugh likewise built the famous kitchen in which were seven chimneys. Bishop Le Bee contributed something towards improving this palace, but no memorials exist to point out what these improvements were. William Alnwick, Bishop of Norwich, was translated to the See of Lincoln in September, 1436, and was a considerable benefactor to both cathedrals; to this munificence and taste the palace was indebted for the great entrance, tower, and curious chapel. The tower, which is yet tolerably entire, is a specimen of excellent stone work; it is a square building, with a large turret at the north-west corner, in which is the remnant of a very fine winding stone staircase leading to the rooms above (see Plate II.) . . . The bottom part of this tower has answered the purpose of a porch, or vestibule, and formed a communication with several apartments; the principal entrance is in the middle of the north side. On the south and near the east corner is another, leading at present into an open court, but probably at some period to different parts of the building; that on the west led to the grand hall, and another on the east side into a most elegant vaulted passage, which appears to have opened into the chapel. This porch has plain walls, but the roof is finely groined; the ribs spring from the middle of each side, and from a small clustered pillar in each corner. The arms of Bishop Alnwick, a cross moline, are on the pdrils of the entrance arch, and also upon the ancient wooden door; they likewise serve to ornament the bow window, which has been a piece of exquisite workmanship. The curious chapel built by the same munificent prelate, and dedicated to the Blessed Virgin, had in one of the windows lines commemorating the saint and the founder. The walls and roof were almost entire in 1727; but since that period it has been destroyed and all the materials removed; sufficient, however, has escaped the ruthless mallet to show that it once exhibited a beautiful specimen of pointed architecture. 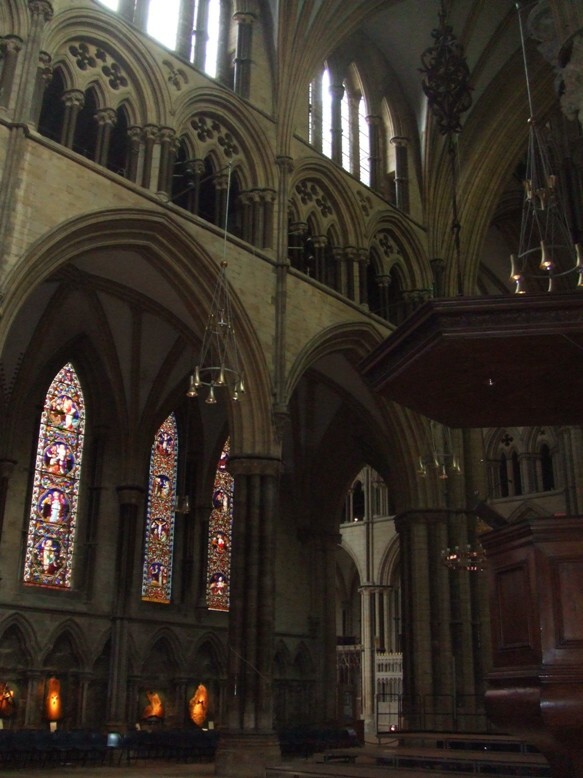 On March 31, 1617, King James I., during his nine days' stay at Lincoln, having heard Bishop Neile preach in the cathedral, dined with him in this noble palace. Those parts of the ruins next the city show three ponderous buttresses, supposed to have been built by Bishop Williams, Dean of Westminster, and Keeper of the Great Seal, who was consecrated Bishop of Lincoln, November 17, 1621. Few years, however, elapsed before the palace of Lincoln, during the unhappy civil contest, was plundered of its riches, its beauty destroyed, and many of its towers levelled with the ground. ...	J. E.